It has come to my attention that I have not posted a little boys- specific update in over a year now. Oops. You are now 2 years old and a sweet, laid back boy. While you can play independently with toys for a long stretch, playing with adults is your absolute favorite. We make up game after game and sing song after song. You can never get enough. 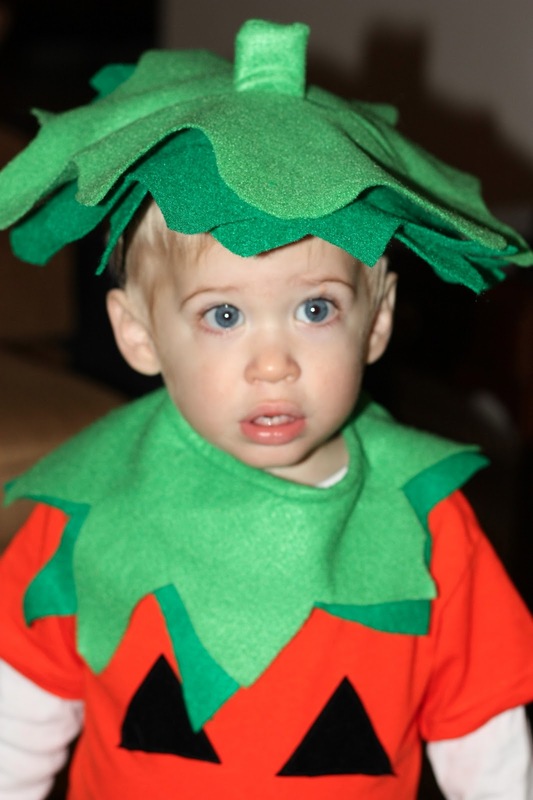 You were a pumpkin for Halloween this year. You are starting to be more into your older brother, but G is definitely more fond of you than you are of him at this point. He loves to hug and take care of you. You usually try to block him. In February you started going to pre-school with G one day a week. You love it. You recently took your first nap in Mommy's bed. Too, too sweet. You enjoyed Easter more this year, but still haven't totally gotten the egg hunting down. That's OK, because G did well for you both. Food: Fruit/veggie pouches, meat in general. If we let you, you would eat your weight in meat on a daily basis. TV/Movie: "Thomas" and "Mickey Mouse Clubhouse"
G: You are now 4 years old and a LOT of fun! 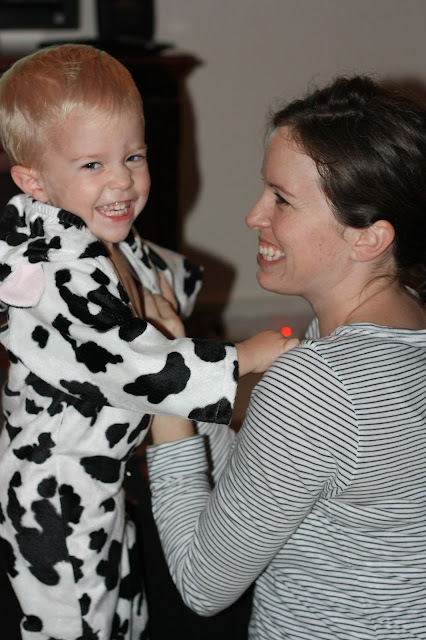 You were a cow for Halloween. You enjoyed the fruits of our clementine tree this year. Peeling them anyway, you didn't eat all that much of it. You grew in height this year and stayed well ahead of your brother. You got to go on a special trip to Spain with just Daddy and Uncle Matt. 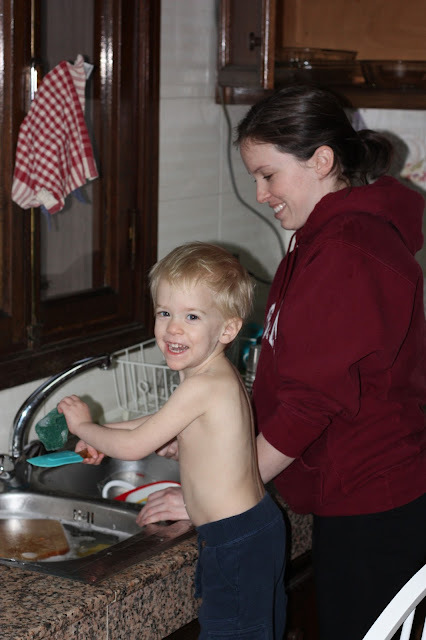 You learned to wash dishes play in the sink. You are getting so big and learning new things all the time! 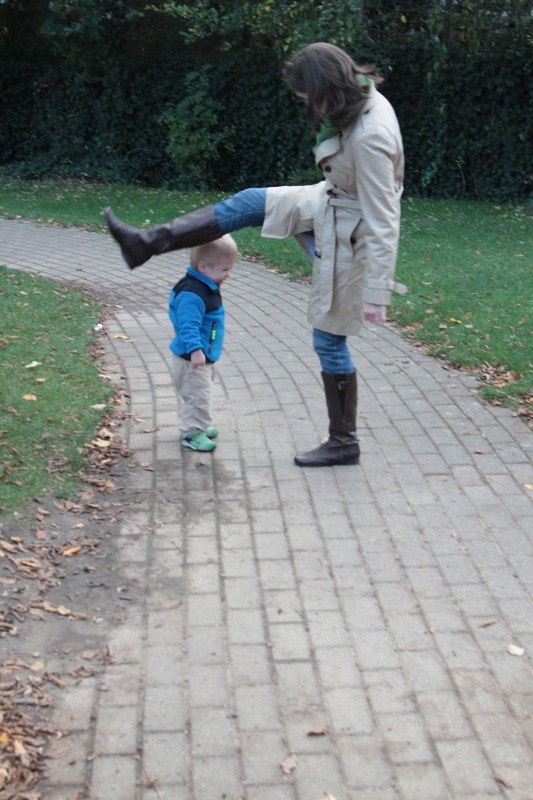 TV/Movie: "The Sound of Music" and "Thomas"
Sayings: "Is Daddy/Mommy cramping your style? ", "Make a video?" Your least favorites: Going to bed, when Daddy leaves to go, well, anywhere, and insects buzzing around you. Your Birthday party: We had a combined, low- key, inexpensive birthday party this year. (Seriously, I probably spent $40) All your friends and their parents came over for a Saturday morning play date and coffee/cupcakes/treat bags. I have to say, it was a huge hit. The kids played great together and the adults were able to enjoy each other's company. Birthday pics with our favorite playmate outside Mommy and Daddy: Uncle Matt. "Mommy, I can't be bothered to smile for a picture right now. I have a cupcake in my hand!" The best pic we could get with J.